A few weekends ago, I found myself helping out at a workshop at the Remick Farm Museum. I was mostly in charge of the camera for the event, which was a lot of fun. I haven't really had the opportunity to be an 'event photographer' well, ever. I guess my photography prowess showed and Erica (the event coordinator) put me in touch with a woman who is writing a book and needed someone to take the cover photograph. 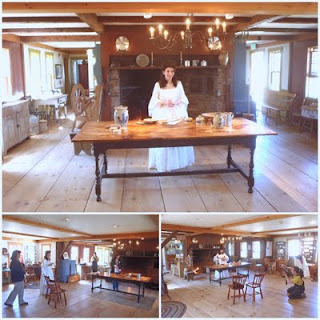 The book is set during the time of the Revolutionary War and the photograph was going to be taken at the Remick in front of the hearth. Last Friday Patrick + I headed over to the Remick to have a photo shoot. It was a lot of fun - I haven't had a 'model' since my college photography courses - but I think we were able to get quite a few good shots.... We'll see once the book comes out!